The majority of Forex trading books usually offer simplest trading systems as the educational material. But as of today such systems exist only as general instructions without a proper implementation of such trading strategies in the form of ready-to-use Expert Advisors. So now it is impossible to estimate whether such examples contain any practical value. If we look through numerous forums dedicated to EA writing, we can conclude that almost every beginning EA writer has to reinvent the wheel and develop their first Expert Advisors based on simplest trading systems from the very beginning. I consider the value of such work rather doubtful and think it is necessary to make available to any beginning trader correctly developed EAs based on these trading systems thus delivering from the necessity of starting everything form scratch. In this article I would like to offer my own variant of the problem solution. 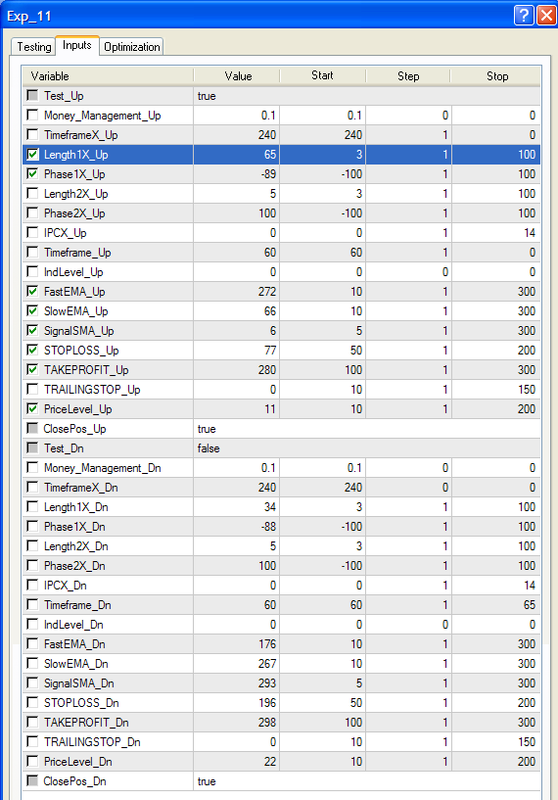 For EA building I will use indicators from my own library that I have already used in the article Effective Averaging Algorithms with Minimal Lag: Use in Indicators. #property copyright "Copyright © 2007, Nikolay Kositsin"
To get Buy and Sell signals two absolutely similar independent algorithms are used; each of the algorithms has its own external parameters for optimization. My own experience proves that using this kind of approach to this EA writing is much more profitable than the variant with only one algorithm for detecting Buy and Sell signals. Those who are interested in the variant with a single moving both for short and long positions can study this algorithm in the EXP_0.mq4 EA; we will continue discussing the EA with two movings. The Expert Advisor can open one position in Buy direction and one position in Sell direction simultaneously for one traded pair. The EA executes trades from the market. Trades are closed by StopLoss and TakeProfit orders. If trend signals appear opposite to positions opened in the EA, the EA allows the forced trade closing. The method of receiving signals to exit trades is analogous with that of getting signals to enter, but is of the contrary character. The OpenBuyOrder1() function opens long positions when it is called, if the value of the external variable BUY_Signal is equal to true and there are no open positions, the identification (magic) number of which is equal to the value of the MagicNumber variable. Values of external variables STOPLOSS and TAKEPROFIT define correspondingly the value of StopLoss and TakeProfit in points. The value of Money_Management variable can vary from zero to one. This variable denotes what part of available deposit is used for trade execution. If the value of this variable is less than zero, the OpenBuyOrder1() function will use its value as lot size! Short positions are opened in the analogous way when the OpenSellOrder1() function is called. Both functions open positions irrespective of each other, but only one command for trade execution can be sent to a server within 11 seconds. Besides the execution of trades, OpenBuyOrder1() and OpenSellOrder1() functions record into a log file the information about opened trades. If the Stop_Signal variable gets the true value, the CloseOrder1() function, when referred to, closes a position with the magic number equal to the value of MagicNumber variable. StopCorrect() function accepts as the Stop parameter the StopLoss or TakeProfit value, checks its correspondence with the minimally accepted value, if necessary changes it to the minimally allowed value and returns it taking into account possible corrections. Assignment of the MarginCheck() function denotes the lessening of lot size that is used in an opened trade up to the maximal size, at which free margin is enough to open the trade, for the case when the free margin is not enough with the current lot size. OpenBuyOrder1(), OpenSellOrder1() and CloseOrder1() are used inside the start() function, while StopCorrect() and MarginCheck() functions are used inside the code of OpenBuyOrder1() and OpenSellOrder1(). At a correct finish of OpenBuyOrder1(), OpenSellOrder1() and CloseOrder1() any of the functions returns 'true', if an error occurs during the execution of the functions, the returned value is 'false'. All the three functions: OpenBuyOrder1(), OpenSellOrder1() and CloseOrder1() at trade execution send the values of their external variables BUY_Signal, SELL_Signal and Stop_Signal into 'false'! The GetFreeMargin() function returns free margin size of the current account allowing for profit and loss that can be used for position opening. This function is used to calculate the lot size. Besides the above enumerated functions, the file Lite_EXPERT.mqh contains four more functions for placing pending orders and one function for deleting pending orders: OpenBuyLimitOrder(), OpenBuyStopOrder1(), OpenSellLimitOrder1(), OpenSellStopOrder1(), DeleteOrder1(). Assignment of external variables of these functions is absolutely analogous and understandable from their names. New variables LEVEL and Expiration are necessary to send to a function the distance in points from the current price, on which pending orders are placed, and the pending order expiration date accordingly. Besides all discussed functions the file contains two more functions: OpenBuylOrder2() and OpenSellOrder2(), which are full analogues of OpenBuyOrder1() and OpenSellOrder1(), except for one detail. These functions first open positions without StopLoss and TakeProfit orders and after that modify already opened positions setting StopLoss and TakeProfit. These functions are necessary for operation in EAs developed to be used with brokers that do not allow a Client to place Stop Loss and Take Profit when opening a position upon market because of the "Market Watch" execution type. In such brokerage companies Stop Loss and Take Profit orders are placed by way of modifying an opened position. And the last function included into the file is Make_TreilingStop(). The function performs a standard trailing stop. Besides functions, Lite_EXPERT.mqh contains a full variable LastTime, which is declared on a global level because it is used in all functions for opening orders. is necessary to eliminate the EA's signals recalculation for entering the market at each tick; the EA should do this only at bar changing, which will sufficiently save computer resources and EA optimization time. This is the reason why the LastBars_Up variable is declared as a static variable - to remember the number of bars on the previous tick of the int start() function. Initialization of BUY_Sign and BUY_Stop for entering and exiting the market is performed only once at bar changing; they should hold the value until the trade is executed or closed or until one more change of bars takes place. That is why these variables are declared as static. I suppose, other EA details are quite clear and can be understood from the code. Now we have two consecutive JMA smoothing, each one needs at least 30 bars and 4 bars for the calculation algorithm of the EA. After that in the block of gaining source values the custom indicator reference should be changed into the one placed at the beginning of the paragraph. For the second part of the algorithm everything is done in the same way. Thus, we may use not only movings, but also oscillators which can be sometimes very useful. The ready EA code based on J2JMA is included into EXP_2.mqh file. Now on the example of the given EA let us discuss some optimization details of all EAs that will be included in these articles. As mentioned earlier, there are two independent algorithms in the EA - for working with long and short positions. Naturally, it is more convenient and quicker to optimize the EA only for Buy or Sell direction at a time. 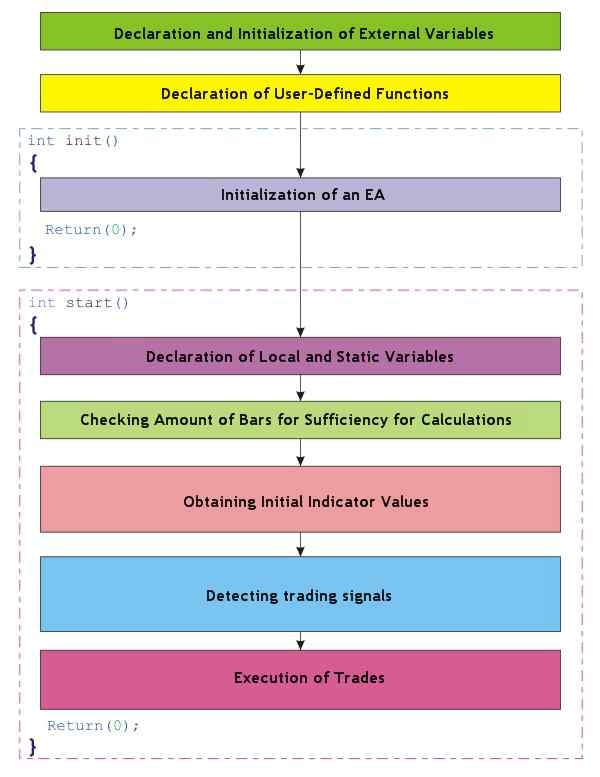 For this purpose there are two external variables of the EA - Test_Up and Test_Dn accordingly. Here we assign 'true' to one of the external variables Test_Up and Test_Dn and 'false' to the second one. 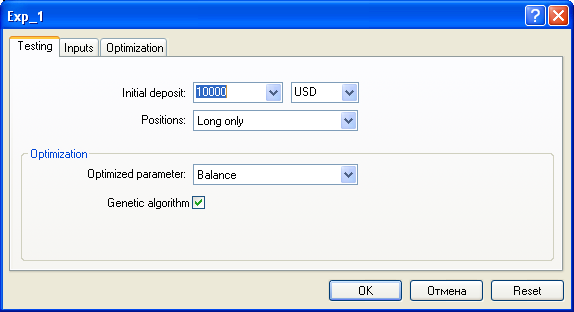 Then assign to Timeframe_Up and Timeframe_Dn variables values of chart periods, on which the optimization will be conducted, in Money_Management_Up and Money_Management_Dn define the part of deposit used to execute Buy and Sell trades correspondingly. It is not very convenient to use the window in this form and the maximized form is more preferable in such cases. Client terminal does not allow maximizing the window, so an additional file for maximizing was created (OpenExp.exe). This file maximized the properties window of EAs the name of whose fies start from Exp_ c (case sensitive). For using the file it should be started from some directory, after that the program module will wait for the appearance of EA properties window and change its sizes; in such a moment it is not recommended to move a mouse. These errors are not connected with the EA itself! It is just that optimization period should be chosen from what is available, and not what is desired! The fact is, JFATL with Length_Up equal to four is an indicator of very quick trends; this combined with the minute chart, on which the EA operates, gives such a system the possibility to fix the scale of price changing even in ten-fifteen points, that is why the outstanding testing result with such large stop loss and take profit values denotes only the fact that during the optimization the market experienced a strong trend, which is not detected in the system itself. So it should be understood that after uploading these parameters the EA will hardly show such good results. However, if you can detect the presence of a strong trend in the market using some other tools, then using of such parameters can be justified. The range of the variable Phase_Up values change is from -100 to +100. When the values are equal to -100 transient processes of JFATL moving are of minimal character, but my experience shows that the best optimization results are obtained when the value is +100. The IPC_Up variable defines, what prices will be used for further processing by JFATL algorithm. Using the ClosePos_Up variable enables the forced position closing if a trend against an opened position starts. It should be taken into account that if take profit and stop loss are placed too far from the market, all positions will be closed upon Moving signals and TP and SL will not influence trading if the value of ClosePos_Up is equal to 'true'! Here I have to end the explanation, the optimization topic discussed at the end of the article is too large. So what is remained will be described in the next article. The main purpose of the first article is showing to a reader my own method of writing Expert Advisors and offering an easier and rather universal way of building an EA code having very little experience of EA writing. This task is solved in the article, I suppose. In the next article I will explain some features of analyzing optimization results and will offer you one for trading system. As for the EAs that are included into the article as examples, please note that the are too simple and can be hardly used for a full-valued automated trading. However, they can be quite useful for the automation of separate trading operations as tools of working when a trader leaves his client terminal at some moments of time. The indicators zip file is corrupt - will not decompress. Tried winzip and 7-zip. You certainly have a problem on your side. I just tried and the zip is ok. (I also tried for the other posts you made). indicators, when copied to proper MQL subdir, gives "unspecified" error. but only for those with numbers in the name..
i also see the same problem that the indicator and tester zip files cant be unziped ...why? I am new to MQL4 and these articles have been extremely helpful. Thank you. Hey Do you have any Ready Made profitable non repaint EA's for sale....pls let me know....i Have lost only not yet Earned a 1 $ After all these 6 -7 Year's? The article describes a simple, accessible language of graphical trading requests compatible with traditional technical analysis. 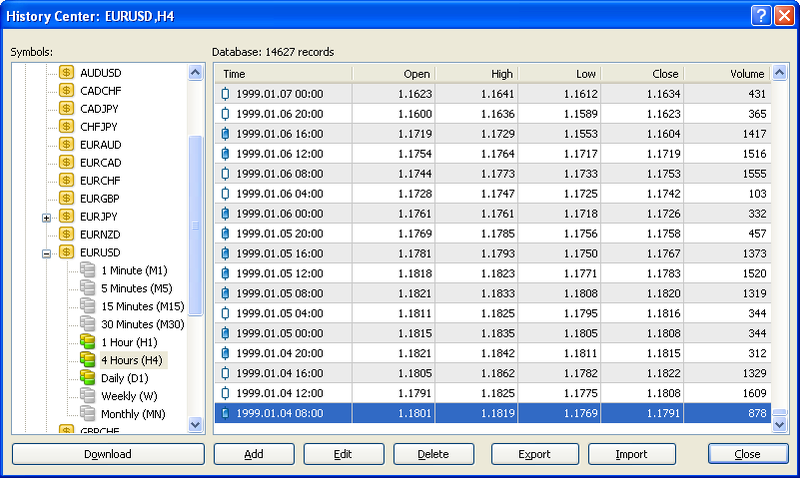 The attached Gterminal is a half-automated Expert Advisor using in trading results of graphical analysis. Better used for self-education and training of beginning traders. It is usually easier to show, than to explain. We offer a simple and free way to create a video clip using CamStudio for publishing it in MQL.community forums. The article describes an Expert Advisor that allows conducting the comparative analysis of 30 indicators and oscillators aiming at the formation of an effective package of indexes for trading. The first demonstration of testing results of a strategy based on 0.1 lot is becoming a standard de facto in the Forum. Having received "not so bad" from professionals, a beginner sees that "0.1" testing brings rather modest results and decides to introduce an aggressive money management thinking that positive mathematic expectation automatically provides positive results. Let's see what results can be achieved. Together with that we will try to construct several artificial balance graphs that are very instructive.